John Joseph Adams was one of the winners at Sasquan. As part of the LIGHTSPEED editorial team, he took home a Hugo for Best Semiprozine. But he also won one of our Alfies as Best Editor, Short Form. Though I searched for JJA in the aftermath of the Hugo ceremony in Spokane, I was never able to find him (he was in the bar, as it happens) to give him an invite to the Hugo Losers Party. So he was not on hand to accept his trophy. We shipped it to him instead. It's finally turned up on his end, and he was kind enough to send a picture of the Alfie sandwiched between his two Hugos (from Sasquan and Loncon). The Alfie doesn't have a name plate yet, you'll notice. Since we had no way of knowing the winners until after the Hugo nominations were released, we could not get them engraved ahead of time. But the plates are being engraved now, and will be shipped out shortly. John writes, "The Alfie just arrived -- it looks so fabulous! Thanks again so so much! I've attached a picture of it in between my Hugos. It's extra cool to win an Alfie for me -- THE STARS MY DESTINATION is my favorite book, and is kind of responsible for becoming an editor in the first place. I even invoked it in the opening of the foreword to volume one of BEST AMERICAN SCIENCE FICTION AND FANTASY." Anyway, John, congrats, and thanks for sending the picture. They... dropped the best novel category? That makes absolutely no sense to me. Out of curiosity, what would have been eligible that year besides The Stars My Destination (which by the way I have started reading 2 days ago). In the early days of the Hugo Awards, the categories were decided by the individual Worldcon committees. It wasn't until the 1960s that something recognizably like what we have today, with the members of Worldcon, through the Business Meeting, deciding what the categories should be and how the Awards should be administered. The 1957 Hugo Awards in London, with only three categories (all of them for magazines: Fanzine, British Prozine, and American Prozine), were particularly strange in this free-form period. That makes me very tempted to suggest allowing retro-Hugos for years that had particularly thin years for categories. But I think that would be just 1957. Well wouldn't not giving out a novel, novella OR short fiction award basically mean the spirit of the "if a world con did not give out Hugos" rule would apply if maybe not the exact wording? My theory is that the Worldcon committee, knowing this, didn't feel that a Best Novel Hugo was necessary. That would be an odd decision today, but remember that at that time the Hugos were not firmly established, they had much less prestige than the IFA, and awards were few and the overlap and duplication we're used to today were unknown. The book that received the IFA that year? Tolkien's The Lord of the Rings. Congratulations on this. I was wondering how come there aren't more nominations and awards for Ty Frank and Daniel Abraham and their fantastic series of novels comprising 'The Expanse" saga! Their novels and novellas are simply put, some of the best books in recent memory, at least for me!!! These books are just outstanding. A space opera epic with both brains and brawn, fuel for the imagination. It has been due to works like "A Song Of Ice And Fire", "The Expanse", "The Wheel Of Time", "The King Killer Chronicle" and others, that my love for reading has remained intact, especially during a day and age when there are soo many distractions. I sincerely hope that in the near future their work gets the richly deserved recognition they should be welcomed to! Sweet! Much as I join you in hoping the Alfies remain a one-shot, I think it's utterly fabulous that you created them. Just a few hours ago, I had the pleasure of watching video of Alfred Bester speaking in honor of Robert Heinlein during the GoH Banquet at MidAmeriCon. It was part of the initial tests we're doing on the project to digitize the Worldcon material in the Scott Imes Video Archive. There's more to come: the inventory includes a tape of Ro Nagy interviewing Bester. We look forward to sharing the 1976 videos at MidAmeriCon II next August! If you were to make a standardized Alfie statue, this particular one would be very appropriate because it looks almost exactly like the letter A in Glagolitic, a medieval Slavic script (http://glagoljica.stin.hr/index.php?menu=110&action=3) that is no longer used. A for Alfie and all that. Hmmmmm. Yes, well... it's actually from a 1955 Mercury. Which is also apt for an SF award, Mercury being a planet and all. You didn't check the bar? Np. Pretty dim of me, I agree. Missing writers are ALWAYS in the bar. Editors too, I guess. If ya can't make it prestigious then by God make your award large. Some of the Alfies were bigger than others. They are all made from hood ornaments, after all, and the size of those varied considerably. The two editor Alfies, as above, were twins, but were by no means the largest. That distinction went to the one we gave to Pat Rothfuss for Best Novella. And then there was the Alfie that went to Bob Silverberg, which was smaller, but had the added feature of lighting up. Very cool. Prestige, of course, is all in the eye of the beholder. Perhaps for a future Alfie you would consider a Mazda inspired design George (if you Google Mazda hood ornamentation there are some beautiful examples over the years). Being a fellow Rx7 fan/driver, IMO it would be a notable and interesting award with a bit of trivia behind it. 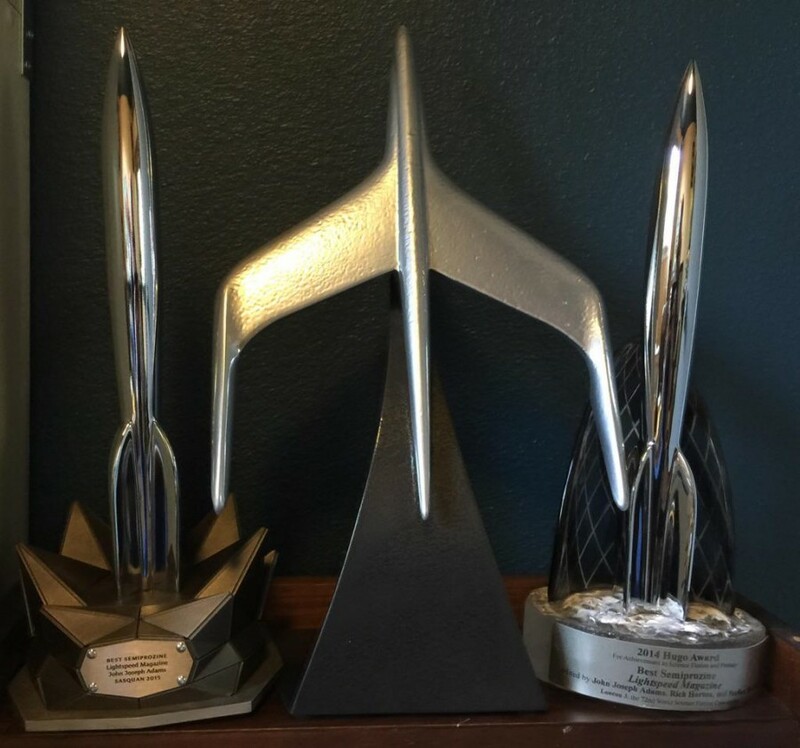 Anyway, great picture in this post, that Alfie really pops between the two Hugo awards. I wonder if you've ever taken a picture of all your awards standing in formation George? I wonder if this is even possible as I'm sure many are certificate types hanging on a wall someplace, but I know a lot of your fans and fandom in general would be quite interested in such a picture. I visualize it being the sort of thing Annie Leibovitz would photograph. My awards are scattered between my home and my office. I recall reading that you have 2 homes in close proximity, and use one primarily for living, the other for working/writing/etc. I can imagine having awards and other interesting items of note becoming spread throughout the two residences making it difficult for a single "shoot". IRRC you did have the media into your homes before for a tour George, I can just no longer find it anywhere online. Perhaps sometime in the future if you're ever able to squeeze it in, an updated "At home with GRRM" sort of tv/youtube spot could be organized, I know I and many of my friends would love to see a detailed examination of your collection of Fantasy/SciFi memorabilia, you miniatures, ASOIAF items, Wild Cards stuff, and so on. Even where you watch your NFL games is interesting to the public - Go Jets! I realize it's asking a lot to allow the public/world/internet into your home and privacy, such is the life of a famous and interesting person I would guess. I love how the included pic has the two Hugos Awards, whose bases were designed by friends of mine.